Handsome Find is the Extra Virgin Olive Oil created by Harry and Florence Jones, but the story started long before them. In 2007, Harry and Florence decided to leave high pressure jobs in London in the pursuit of a simpler life. When they bought an old property on the slopes of Monte Cetona, in Southern Tuscany, they had no idea that they had inadvertently bought an abandoned 13th century olive grove. To their delight the Grove bare a handsome crop of olives and they’ve have spent the last ten years harvesting and nurturing the grove to make the perfect blend of extra virgin olive oil. Attention to detail in the naming process added meaning to H+F from Harry and Florence's initials to combine with the groves bountiful harvest when settling on Handsome Find. An unfussy logo and understated brand identity was created with purpose so as not to detract attention from the premium product itself. When it came to packaging, the logo was applied to the bottle using a blind emboss. The bottles matt black appearance was produced with an olive wood cork stopper to protect the oil from exposure to harmful sunlight. Essential consumption details are housed on a tab label which also acts as a breakable seal to the cork stopper. 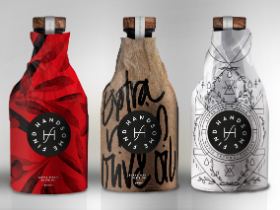 Each bottle is encased in a bespoke patterned wrap. The product will be produced with a range of bespoke paper wraps which will appear on short runs and become collectable.